Aeronautics has been a cornerstone of the UT Arlington curriculum since it was called North Texas Agricultural College in the 1930s. The first courses in aero mechanics were vocational, and they were conducted near Grand Prairie Municipal Airport. During WWII, the focus of many programs was shifted to support the national war effort. A pilot training program was started, and the aero mechanics courses expanded to include construction and maintenance of aircraft components. NTAC was also involved with the Navy V-12 program. Construction of an aeronautical building was completed in 1941 near the current site of Nedderman Hall on Cooper Street. A few images below show this building in 1941. Students assembling a Wright Cyclone engine. Students working on aircraft components. Advanced and preliminary students and their instructor, Paul Allen (NTAC 1941). Students working with Wright Cyclone and Allison V-12 engines. 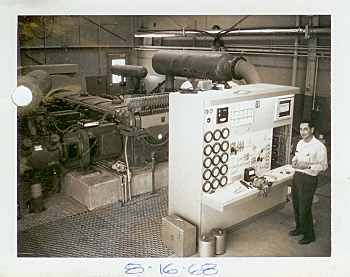 In 1985, a 5-stage Clark compressor system associated with an Army 7 x 10 wind tunnel at NASA Ames was donated to UT Arlington. A few pictures from its original installation at NASA Ames are shown below. The expense of transporting it and purchasing associated equipment cost approximately $500,000.00. This compressor has been the most important piece of equipment at the ARC as we have been able to use it to support the operation of transonic, supersonic, and hypersonic wind tunnels. Another set of pictures from 1986 show the installation of the compressor and construction of the ARC. Control board (nearly finished) with compressor stages in the background. 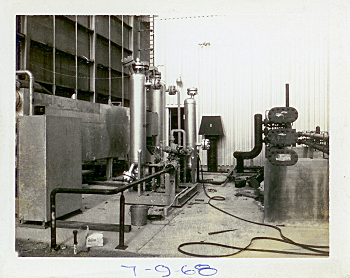 Dehydrator tanks (center) and aftercoolers (right) under construction. Installation of a compressor section on the new foundation at UT Arlington. Construction of the office area during the compressor installation.